A well-informed official source close to the establishment has conveyed to the Government of India, particularly the Prime Minister’s Office and the intelligence-gathering network working for it, that Narendra Modi’s former detractors in Gujarat BJP are behind the current Patidar (or Patel) caste stir for reservation that has engulfed the state. The source has told Counterview on condition of anonymity that, in the report, sent to Delhi, it has been “specifically mentioned that circles to top Modi detractor and his predecessor in Gujarat, ex-chief minister Keshubhai Patel” were backing the Patels’ well-represented rallies, whether it is North Gujarat towns, or Surat, or Ahmedabad. The source said, the report sent to Delhi “specifically mentions” a few of the names of diamond tycoons of Surat, belonging to the Patel community, who had been close to Keshubhai Patel’s earlier anti-Modi movements and have been funding his supporters even now. It is well known that these diamond tycoons, belonging to Amreli district of the Saurashtra region and settled in Surat, had all along strongly supported Keshubhai Patel in organizing an aborted Patel farmers’ movement during the second half of 2000s. The report has been sent even as political circles, both of the BJP and the Congress, are keeping their fingers crossed as to who is behind the Patidar reservation stir. While maintaining that the entire movement is spontaneous, there is a sense of frustration: That the the stir has metamorphosed into a major mobilization. AT least a big section of the BJP leaders has begun sounding sympathetic to it. Gujarat BJP chief RC Faldu, belonging to the same Patel sub-caste to which Keshubhai Patel belongs, Leuva, has said that the state government should “look into” the demand for quota for Patels and other poor families from other upper caste communities. “Taking into account the sensitivity of the issue, we have told the government it is high time that it gave a serious thought to the difficulties faced not only by children of the Patidars, but also by children of economically backward families of other upper castes”, Faldu has been quoted as saying in Rajkot, which is the business nerve-centre of Saurashtra. Earlier, a speaking at a ceremony in Dhari town of Amreli district, local BJP MLA Nalin Kotadiya, who had joined Keshubhai Patel’s now disbanded Gujarat Parivartan Party (GPP), declared his open support to Patel agitation. “Having been born in a Patel family and having been elected MLA by votes of Patels, it is my moral duty to stand by them. Therefore, if Patel community wishes that I should resign as an MLA and support them openly, I am ready to do so,” Kotadiya told a news channel. Kotadia also belongs to Keshubhai’s Leuva Patel sub-caste. 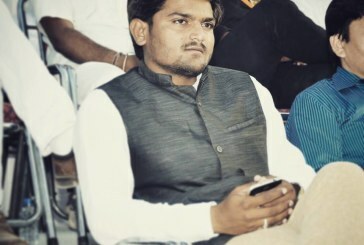 According to this politician, the main leader, a young man, Hardik Patel, 22, who is convener of the Sardar Patel Sevadal which is leading the stir, was on social media and supporting Congress MLA fighting from Viramgam constituency in Ahmedabad district, Tejashtree Patel, during the assembly elections in 2012-end.